One of the Dash Panels that appear in Mario Kart: Double Dash!!. Dash Panels (also formatted dash panels, and also called Zippers, Dash Zones, booster arrows, Speed Strips, Rainbow Ramps, Turbo Tiles, and Turbo Plates) are special panels that appear as a stationary power-up in the Mario Kart series. The appearance of these panels has changed throughout the series' history. Dash Panels give powerful bursts of speed for the player's Kart and are often used to achieve maximum speed on big jumps and slopes, as well as to gain advantage over opponents. If the player uses a Mushroom or a Mini-Turbo on any of these panels, nothing will happen; however, the player will go faster if they slipstream over one. 1.1.4 Mario Kart: Double Dash!! Mario driving near a Dash Panel in Bowser Castle 1 from Super Mario Kart. In Super Mario Kart, Dash Panels appear as yellow arrows and are very rare. They appear in seven courses: Bowser Castle 1, Mario Circuit 2, Ghost Valley 2, Bowser Castle 2, Mario Circuit 3, Bowser Castle 3 and Ghost Valley 3. In Mario Circuit 2 the arrows are used to make a large jump and are mandatory in order to complete the track. Donkey Kong on a Dash Panel in DK's Jungle Parkway. Dash Panels return in Mario Kart 64 in two courses: Royal Raceway and DK's Jungle Parkway. They appear as yellow and red scrolling arrows, and are used to launch racers over large gaps (similar to the cannons that appears in future Mario Kart courses like DK Mountain and Airship Fortress). 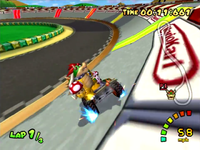 The ramps in Koopa Troopa Beach are also red and yellow, but the arrows look different and they do not have Dash Panels on them, and thus do not launch or speed up racers. Toad near a row of Dash Panels in Riverside Park from Mario Kart: Super Circuit. 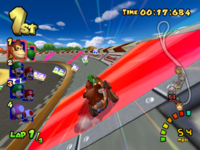 Dash Panels reappear in Mario Kart: Super Circuit, with there design being similar to their design in the previous game, albeit being smaller. Unlike in previous games, they are fairly common, appearing in fourteen courses. They once again provide a burst of speed like in Super Mario Kart but are often used to make large jumps off ramps, such as in Ribbon Road. With the exception of Mario Circuit 2, all extra courses had their Dash Panels removed. Luigi and Bowser about to drive on some Dash Panels in Luigi Circuit from Mario Kart: Double Dash!!. Dash Panels reappear in Mario Kart: Double Dash! !, where they are designed as rainbow-colored panels and are now rectangle-shaped. In this game, Dash Panels are more powerful, being just as fast as a Mushroom. Yoshi on a Dash Panel in Wario Stadium. In Mario Kart DS, Dash Panels reappear with a design similar to Mario Kart: Double Dash!! 's design except with more vibrant colors. In this game courses with Dash Panels from games older than Mario Kart: Double Dash!! keep the original booster design, such as in GBA Bowser Castle 2. Baby Luigi on a Dash Panel in Luigi Circuit. Dash Panels reappear in Mario Kart Wii, where they have a similar design to the ones in Mario Kart: Double Dash! !, but in most courses, the color only changes from pink to red, orange and yellow. Players can now trick off Dash Ramps in order to get a jump boost. Every nitro course in the game features a Dash Panel, a tradition that would happen in later Mario Kart games. Most retro courses from games older than Mario Kart: Double Dash!! that contain Dash Panels keep the original design, such as in Mario Circuit 3. Vertical dash panels are also introduced in this game, which allows the player to perform tricks off the sides of the courses. A Mii driving near a Dash Panel and a Glide Ramp in Mario Kart 7 in SNES Mario Circuit 2. Dash Panels reappear in Mario Kart 7, where as well as the regular speed boosting orange ones, a new variant called Glide Ramps appear, with these panels not boosting speed and only deploying the Kart's Glider when driven over. Rings are also new, with them providing a short boost of speed when the player is glides through them and thus functioning like an air-based Dash Panel. Pink Gold Peach near Dash Panels and the Glide Ramp in Cloudtop Cruise from Mario Kart 8. In Mario Kart 8 and Mario Kart 8 Deluxe, Dash Panels now have pixelated animations like the ones in Super Mario 3D World. Regular Dash Panels, Glide Ramps from Mario Kart 7 and rings appear in the game, as well as a new Antigravity Panel which denotes the start of an anti-gravity segment and automatically sets the Kart into Anti-gravity mode. It ends automatically, often after a ramp or a gliding section. When going backwards, the anti-gravity automatically turns on/off when passing over the anti-gravity panel. Cloudtop Cruise: The Dash Panels in the thundercloud segment will switch off when struck by lightning. Bowser's Castle: When they are in contact with the Bowser Monument's fist. 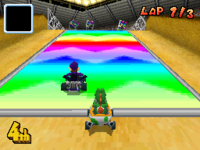 Rainbow Road: They switch on and off when the conveyor belts change directions. Hyrule Circuit: When not all of the Spin Boost bumper's diamonds are lit up. Super Bell Subway: When a train drives on one, the Dash Panel will shut down. In Cloudtop Cruise, Bowser's Castle, and Super Bell Subway, players can drive on the Dash Panels that are in contact with hazardous obstacles, but they cannot get a boost when the panels are in their inactive state. The three Zippers, from left to right: Car, Hovercraft and Plane. Zippers appear in Diddy Kong Racing and Diddy Kong Racing DS, with their functionality being nearly identical to the Dash Panels of the Mario Kart franchise. There are three variants of Zippers, one for each vehicle: Cars, Hovercrafts, and Planes. Each vehicle's Zipper has its own appearance and are positioned based on the associated terrain. Car Zippers are arrow-shaped panels placed on the ground, the Hovercraft variant is shaped like a triangle, and are located on bodies of water. Lastly, the Plane variant is ring-shaped and is located in the air. All three vehicles can technically use each Zipper variant, but some vehicles cannot reach some of their variants. Planes can reach any type of Zipper, Hovercrafts can only use the waterborne and ground variants, while Cars can only use Zippers on land. Zippers sometimes do not appear if a player drives in an unassociated vehicle. Zippers give off a greater boost of speed if the player lets go of the button before hitting one. Additionally, Plane Zippers briefly lag the game if approached at a certain angle. Dash Panels appear in the Nintendo DS version of Mario & Sonic at the Olympic Games, were they appear in the Dream Race event and function similarly to their appearances in other games. Dash Panels reappear in the Nintendo DS version of Mario & Sonic at the Olympic Winter Games, where they appear in the Ski Cross Racing event, functioning the same way as in other games and keeping the same design. Boosted Ramps using various numbers of Dash Panels also appear in this event. Dash Panels also appear in both versions of Mario & Sonic at the London 2012 Olympic Games. In the Wii version, they appear exclusively in the Dream Equestrian event, in which they have been added to the modified Moo Moo Meadows course, while in the Nintendo 3DS version they only appear in the 1500m event, though other items which act similarly appear in the 10km Marathon Swim and Sailing - 470 (Pair) events. Dash Panels (known in this game as Dash Zones) appear in Mario Party 9 in the minigame, Speeding Bullets. They are used to accelerate the character's speed when they are used. These Dash Panels are orange and arrow-shaped. In Time Attack mode, the bonus challenge for Speeding Bullets is to not miss a single Dash Zone. A Dash Panel also appears in Snow Go to help the players crossing thick snow. In Time Attack mode, the bonus challenge is to use it in all ten laps. In Mario Party: Island Tour, Dash Panels are present in two minigames: Gyro for the Gold and Mr. Blizzard's Snow Slalom. In the former, they are used to cross gaps between the platforms of the obstacle course. In the latter, it has the same look from recent Mario Kart Dash Panels and is used to launch the player's snowball at Mr. Blizzard. In Super Mario Party, flat Dash Panels appear in the River Survival mode on the water's surface, boosting the raft forwards when run over. Dash Panels on ramps also appear, which are used to reach minigame balloons and + Clocks suspended in the air. A Dash Panel in Super Mario 3D World. Dash Panels make their debut in the Super Mario series in Super Mario 3D World, for the Wii U. This time, they are square-shaped and feature a pixelated diamond animation. Once a character runs on it, it will blink and give them a boost. Boosted characters cannot stop running or crouch (and so cannot long jump), and cannot make direction changes any sharper than 90 degrees without first being in the air. All characters run at the same speed when boosted. Jumping will slow boosted characters down slightly, especially if an ability such as floating is used, but they'll immediately return to full speed upon landing if the boost had not ran out. Captain Toad running from Charvaarghs. Dash Panels reappear in Captain Toad: Treasure Tracker, where they have the same appearance and function that they had in Super Mario 3D World. They appear in Magma Road Marathon, where the player has to use them in order to advance and to not get hit by Charvaarghs, and they also appear in Drop-Road Dash. In the Nintendo Switch and Nintendo 3DS versions of the game, they also appear in Cookatiel's Sizzling Sprint. Dash Panels appear in Mario & Luigi: Paper Jam, first appearing in the mission Wait Up, Yoshi! in Gloomy Woods. When the Dash Panels are stepped on, the trio dashes in the direction the arrows point. The trio cannot change their direction while they are dashing. Wario near the two Dash Panels in Royal Raceway from Mario Kart 64. Yoshi near a Dash Panel in Yoshi Falls from Mario Kart DS. Peach near a Dash Panel in Mushroom Gorge from Mario Kart Wii. Koopa Troopa near a Dash Panel in Bowser's Castle from Mario Kart 7. ↑ Mario Kart: Double Dash!! instruction booklet. Page 31. ↑ Knight, Michael. (2010) Prima Nintendo DS Pocket Guide. Page 127. ↑ Epstein, Joe, Garitt Rocha, and Alexander Musa. (2017) Mario Kart 8 Deluxe Official Guide (from Prima Games). Page 11. ↑ Musa, Alexander, and Geson Hatchett (2013). Super Mario 3D World Prima Official Game Guide, page 19. ↑ Grimm, Steven. (2003) Mario Kart: Double Dash!! Official Nintendo Player's Guide. Page 31. ↑ Mario Kart DS instruction booklet. Page 36. ↑ Hodgson, David S. J. Mario Kart Wii Premiere Edition. Page 9. ↑ von Esmarch, Nick. (2011) Mario Kart 7 Prima Official Game Guide. Page 46. ↑ Diddy Kong Racing DS instruction booklet. Page 11. ↑ Stratton, Bryan, and Steve Stratton. (2001) Mario Kart: Super Circuit Prima Official Game Guide. Page 39. ↑ Nintendo Power #41, page 89. ↑ Nintendo. (August 22, 2018). Super Mario Party - River Survival Mode - Nintendo Switch. YouTube. Retrieved August 23, 2018. This page was last edited on January 30, 2019, at 18:56.